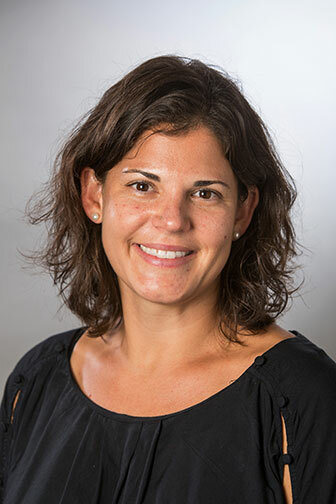 Elena Flowers, PhD, RN, Physiological Nursing, came to UCSF as a research assistant at Zuckerberg San Francisco General Hospital and Trauma Center (ZSFGH) after her undergraduate education at UC Davis. After completing her Master of Science and Doctor of Philosophy degrees in the School of Nursing, she transitioned into her current role as a member of the faculty. Dr. Flowers is now coming up on five years at UCSF. In addition to being a researcher and Assistant Professor, Dr. Flowers is a mom. Photos of her two, young daughters and their painted handprint artwork decorate her office. While her job allows for flexibility, her schedule is anything but slow. It usually requires several hours of work on a Friday night to keep up with her responsibilities. When speaking to the Senate, she had just finished another interview, and she explained that since 10 a.m. she had something scheduled every hour. One thing that helps her adjust to life as a faculty member is the Clinical and Translational Science Institute (CTSI)’s K Scholars Program, which supports career development and the formation of professional relationships with other junior faculty. This program is just one of her many weekly commitments. Flowers works from home one-two days a week and works on various UCSF campuses the remaining days. On Tuesday, Wednesday, and Thursday, she is usually at the Parnassus campus. On Monday and alternating Fridays, she works from home. On the Fridays that she works on-campus, she is at the Mission Bay Campus where she attends the K Scholars Program in the morning and then stays at Mission Bay until 4 p.m., and she occasionally goes to Parnassus. Flowers off-campus days follow the same time schedule as her on-campus days, but because she doesn’t have to commute she works straight from 8:30 a.m.-5:30 p.m. She devotes off-campus days to calls, grant applications, manuscripts, and more research. Some of the calls are with a collaborator at New York University (NYU), her laboratory manager, and conference calls for professional organizations’ research committees where they review abstracts. Flowers does not spend much hands on time in her wet lab, but she oversees the research of students and staff in it and also subcontracts her molecular research to outside core labs. While she does participate in wet lab research, she spends the majority of her research on her computer and in meetings. Recently, Flowers had her own DNA genome sequenced, a project that she said has taken on a life of it’s own. In February, Flowers wrote a blog post for the UCSF Science of Caring website that detailed her genome sequencing experience. Genome sequencing gives the specific three-billion letters of an individual’s DNA. DNA consists of the letters: A, C, G, and T, symbolizing adenine, cytosine, guanine, and thymine. This gives patients the ability to receive a personalized treatment plan for any future diseases or health conditions they might have. Flowers’ article explains that in 2001, genome sequencing was expensive, but with technology advancements in the past 16 years, it is becoming more affordable. Flowers’ genome sequencing is funded by a Faculty Academic Renewal (FAR) Fund grant from the UCSF Academic Senate. While Flowers said she thinks genome sequencing is now more accessible, she is unsure if it is sensible or ethical. For example, her article questioned whether sequencing a newborn’s genome without their consent is ethical. Although Flowers wrestled with these questions, she decided to have her own genome sequenced, in order to better equip the advance practice nursing students she teaches. Flowers is sharing her experience with her students as they learn about the role of genomic technologies in their clinical practice. Flowers recently received her sequencing test results back and while there are no alarming results or surprises, it allows her to have a much deeper meaning of the “Pandora’s box,” that is one’s DNA identity. She also hopes this helps her students think about how to deal with future interactions with patients undergoing genome sequencing. Flowers’ research focuses on genomics involving precision medicine and risk factors for cardiovascular health and type 2 diabetes. Flowers lab is a mixture of dry and wet labs and she collaborates with other faculty members, including Assistant Professor Kord Kober, PhD, Ladder Rank, another UCSF genomic laboratory lead. They manage and oversee the Nursing Genomic Lab together. Their lab functions as a resource to faculty and Flowers and Kober manage faculty activities and facilitate faculty research. Two other faculty members who collaborate and mentor Flowers are Associate Professor Yoshimi Fukuoka, RN, PhD, FAAN, Ladder Rank, and Professor Alka Kanaya, MD, In Residence. Currently, all three are working on a pilot randomized clinical trial (RCT) examining behavioral intervention weight loss for those that are Filipino with type 2 diabetes. Next, they will study gene expression associated with insulin sensitivity and responses to intervention. A previous study Flowers did with Kanaya looked at the effect of yoga on type 2 diabetes risk factors. For this study, they modeled trajectories for fasting blood glucose and microRNAs. Then, they evaluated whether microRNAs predicted risks for type 2 diabetes. As a director of the Genomics Lab, Flowers also interacts with predoctoral students and postdoctoral fellows. With these trainees, Flowers gives students feedback on dissertations, studies design methods, reads papers, gives career advice and training development opportunities, and informs of funding opportunities. For example, one of Flowers’ current postdoctoral fellows is incorporating genetic analysis into a study on sleep apnea in patients with acute coronary syndrome. Flowers also interacts with students through three classes she teaches during the fall, winter, and spring quarters. In the fall, she teaches Introduction to Human Genomics; in the winter, Implication of Genomics for Advanced Practice Nurses; and in the spring, Clinical Applications of Genomics. These classes are a hybrid of online and an in-person class once a week. Flowers believes genomics technologies will transform healthcare at the same level that penicillin and anesthesia did. Kathryn Sill is a Communications Specialist in the Academic Senate Office, San Francisco Division. She can be reached at kathryn.sill@ucsf.edu.